Jumbo pop-ups and electronic noises keep three- to five-year-olds smiling at this fanciful board book. In the first spread, accompanied by fanfare, the ringmaster raises his top hat and a bouquet of flowers spills out. Next are the clowns, who arrive in a tiny car throwing pies and creating chaos, while whizzing noises and horns blast away. On a calmer note or is it? rabbit acrobats glide through the air and crash noisily through the hoop. 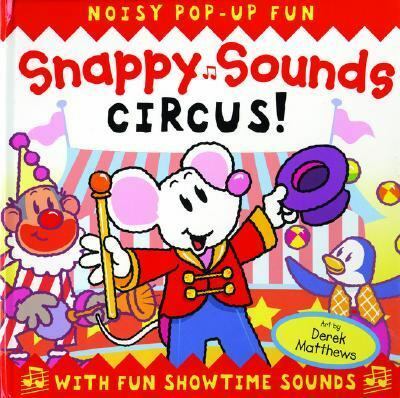 A comical chicken on a high wire and a shaky tower of turtles complete this exciting interactive visit to the circus!Matthews, Derek is the author of 'Snappy Sounds Circus Noisy Pop-Up Fun', published 2006 under ISBN 9781592235643 and ISBN 1592235646. Loading marketplace prices 3 copies from $1.48 How does the rental process work?